In 1930, Joel Basch was still in the tobacco business and living with his wife Jeanette and sons Sidney and Gustavus in Columbus, Ohio. Sidney was working as a clerk in a finance company and Gustavus as a salesman in a furniture store. 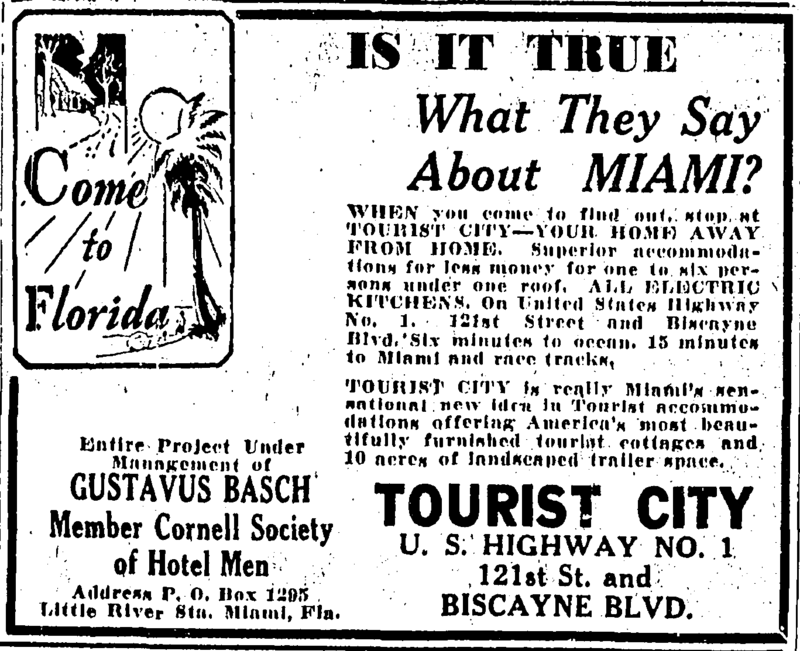 Apparently a “tourist camp” was a place for tourists to stay while vacationing in Miami—a place to park a trailer or rent a cottage. As indicated in the advertisement as well as on Gustavus’ World War II draft registration, this was his own business. His parents, Joel and Jeanette, were listed right above him on the 1940 census, but they were enumerated twice in 1940—once in Columbus living with their older son Sidney, once in Miami with their younger son Gustavus. 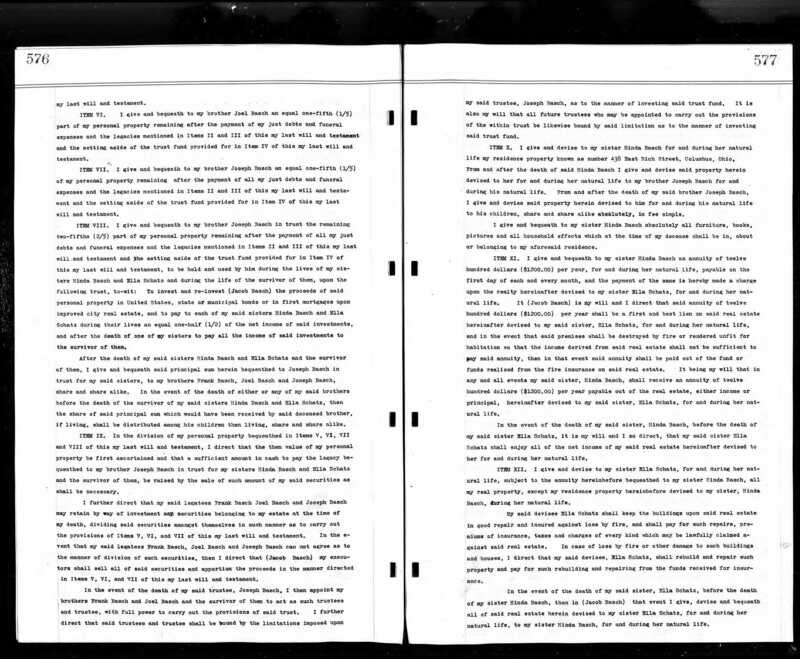 The Columbus enumeration was done on April 11, 1940, and the Miami enumeration was done on April 30, 1940. The Columbus enumeration reported that Joel, now 73, was retired, and that Sidney, 43, was a clerk at an insurance company. 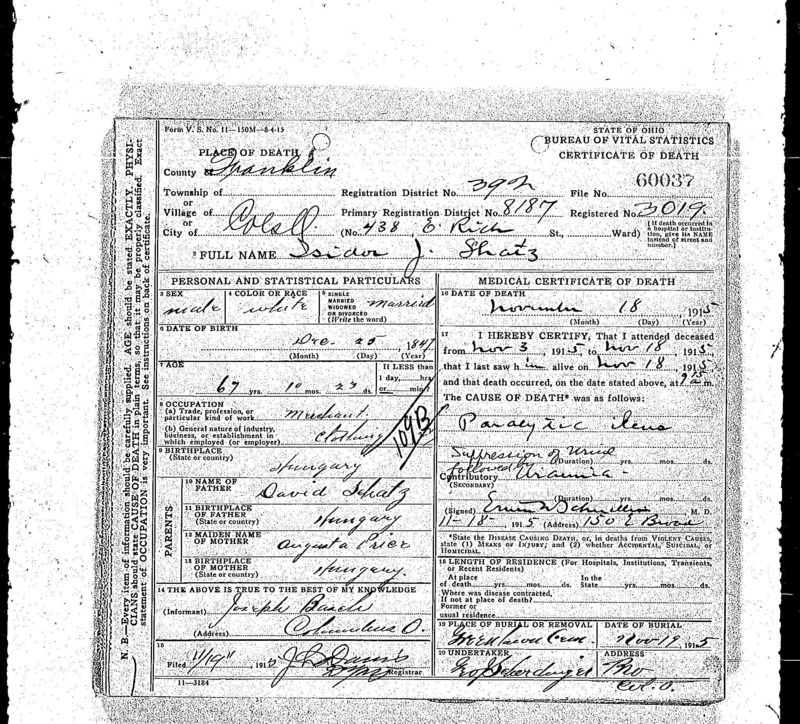 Sidney Basch, death certificate, Ohio Deaths, 1908-1953,” database with images, FamilySearch (https://familysearch.org/ark:/61903/3:1:S3HY-DH64-VL8?cc=1307272&wc=MD96-DTP%3A287601701%2C287601302 : 21 May 2014), 1945 > 00001-03300 > image 1423 of 3510. But Joel only outlived Jeanette by three years. He died on December 8, 1950, from a heart attack and arteriosclerosis. He was 87. 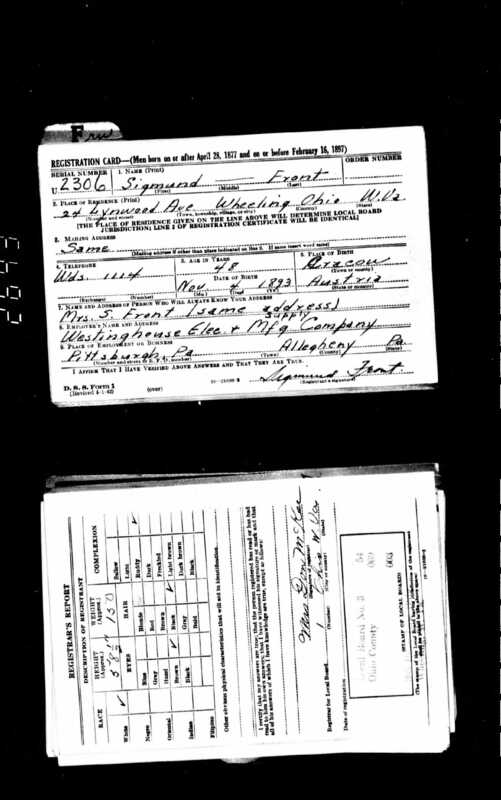 Joel Basch, death certificate, Ohio Deaths, 1908-1953,” database with images, FamilySearch (https://familysearch.org/ark:/61903/3:1:S3HY-6Q67-VC2?cc=1307272&wc=MD9N-9P8%3A287599801%2C294723701 : 21 May 2014), 1950 > 74601-76700 > image 303 of 2329. As neither of Joel and Jeanette’s sons had children, there are no living descendants of Joel and Jeanette (Mendel) Basch. But their stories are not forgotten. In 1930, four of Lena Goldsmith’s six children were still living—Frank, Hinda, Joel, and Joseph. They ranged in age from Joseph at 63 to Frank at 73. Their children, Lena’s grandchildren, were all adults by 1930. In fact, by 1930 Frank had five grandchildren himself, and one more would arrive in the 1930s. Joel and Joseph would also have grandchildren born in the 1930s. And there were also more marriages among the grandchildren in the years that followed. The next three posts will conclude the saga of the Basch family of Columbus, Ohio. This post will complete the stories of Frank and Hinda; Joel and Joseph will be discussed in subsequent posts. 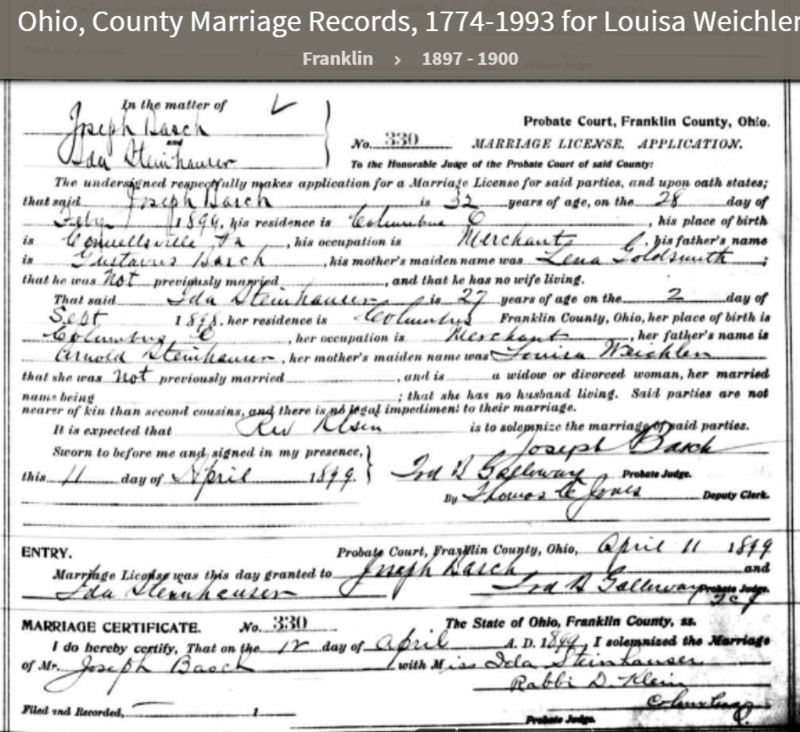 Lewis Basch, marriage record, “Ohio, County Marriages, 1789-2013,” database with images, FamilySearch (https://familysearch.org/ark:/61903/3:1:939L-FZFC?cc=1614804&wc=Q6SP-NLG%3A121350601%2C123701101 : 15 July 2014), Franklin > Marriage index and records 1935-1937 vol 108 > image 208 of 330; county courthouses, Ohio. After marrying Lewis, Maryleone completed her undergraduate degree at Ohio State University. Lewis and Maryleone would have two children in the 1930s. Just three months after her brother Lewis’ wedding, Coryne Basch, Frank and Freda’s daughter, died at age 33 from appendicitis on September 27, 1931. According to her death certificate, Coryne was the owner of a kindergarten. Coryne was survived by her parents, her sisters Rae and Ruth, and her brother Lewis. She had never married or had children. 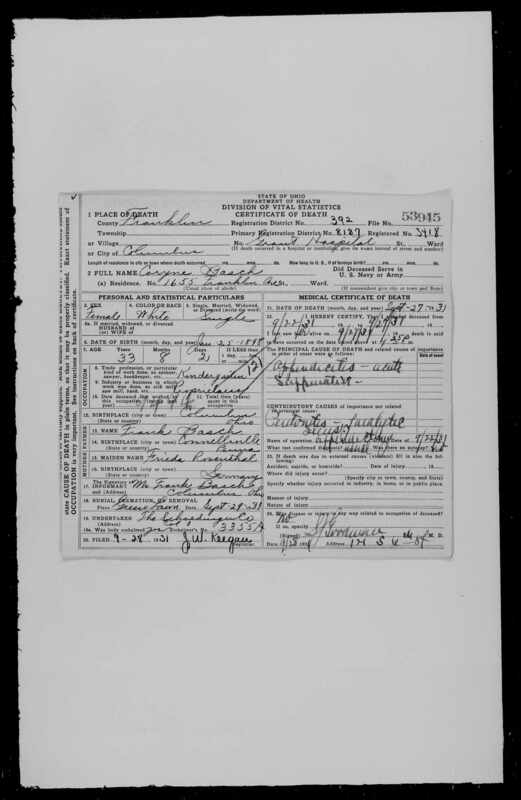 Coryne Basch, death certificate, Ohio Deaths, 1908-1953,” database with images, FamilySearch (https://familysearch.org/ark:/61903/1:1:X6HL-K9C : 8 March 2018), Coryne Basch, 27 Sep 1931; citing Columbus, Franklin, Ohio, reference fn 53945; FHL microfilm 1,992,473. Frank Basch died on January 5, 1934, in Columbus, from coronary disease and hypertension. He was 76 years old. With his death, only three of his siblings remained. 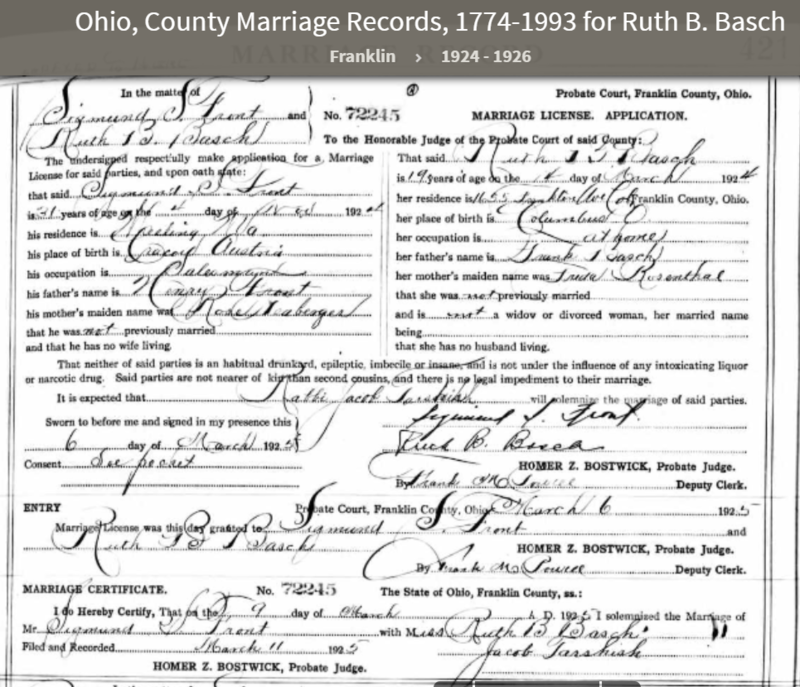 Frank Basch, death certificate, Ohio, County Death Records, 1840-2001,” database with images, FamilySearch (https://familysearch.org/ark:/61903/3:1:S3HY-6QM9-HSN?cc=2128172&wc=7DZ2-PQB%3A1296032501%2C1296824302 : 2 October 2014), Franklin > Death certificates, 1926-1927 > image 1504 of 3280; county courthouses, Ohio. In 1940, Frank’s three surviving children were all living in different places. Lewis and his family were living in Bexley, Ohio, a suburb less than four miles east of Columbus. Lewis was a dentist in private practice.2 His sister Rae was living with her family in Chillicothe, Ohio, fifty miles south of Columbus; her husband Sidney Katz continued to be a clothing merchant.3 Ruth and her husband Sigmund Front and their children were living in Wheeling, West Virginia, in 1940, where Sigmund was managing an electrical supply store.4 Sigmund’s 1942 World War II draft registration revealed that he was no longer working in his father’s Front Company business, but for Westinghouse. 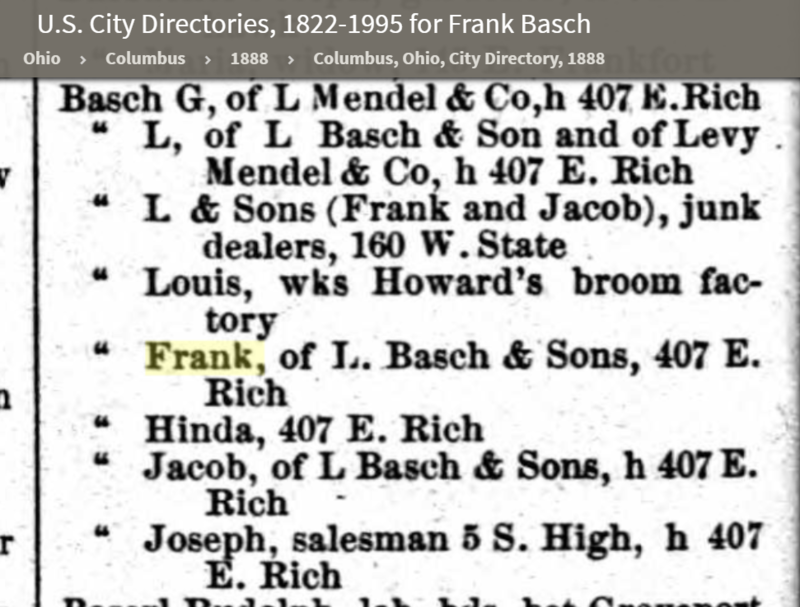 I could not locate Freda Rosenthal Basch, Frank’s widow, on the 1940 census. Rae Basch Katz lost her husband Sidney six years later. He was 57 years old when he died on July 6, 1946.5 She outlived him by 23 years; she died on October 25, 1969, at the age of 73.6 Rae and Sidney were survived by their three daughters. Lewis Basch and his wife Maryleone remained in the Columbus area, and Lewis died there on July 5, 1986, when he was 86 years old.11 He was survived by his wife Maryleone, who died at 90 on February 14, 2001, in Columbus.12 Their daughter survived them as well as their grandchildren. 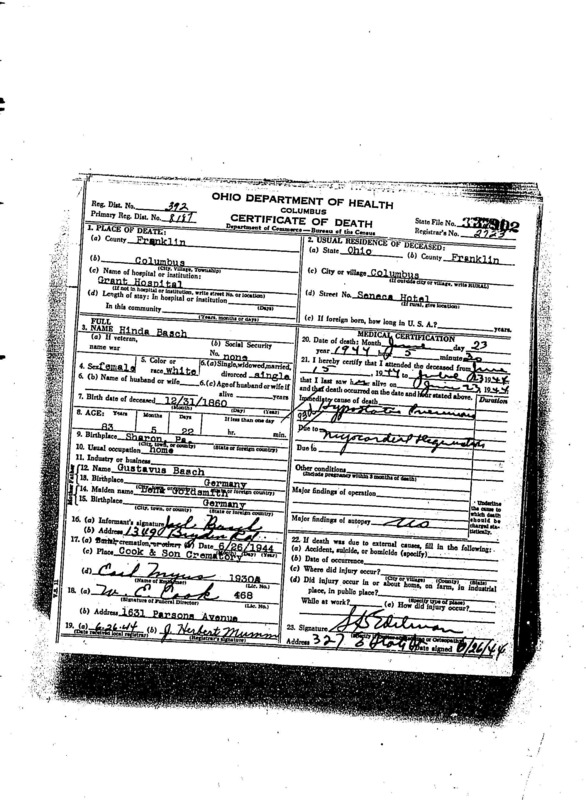 In 1940 Hinda Basch was living alone in Columbus without an occupation.13 She died four years later on June 23, 1944, from hypostatic pneumonia and myocardial degeneration. She was 83. She was survived by her brothers Joel and Joseph and a number of nieces and nephews. She had no direct descendants. 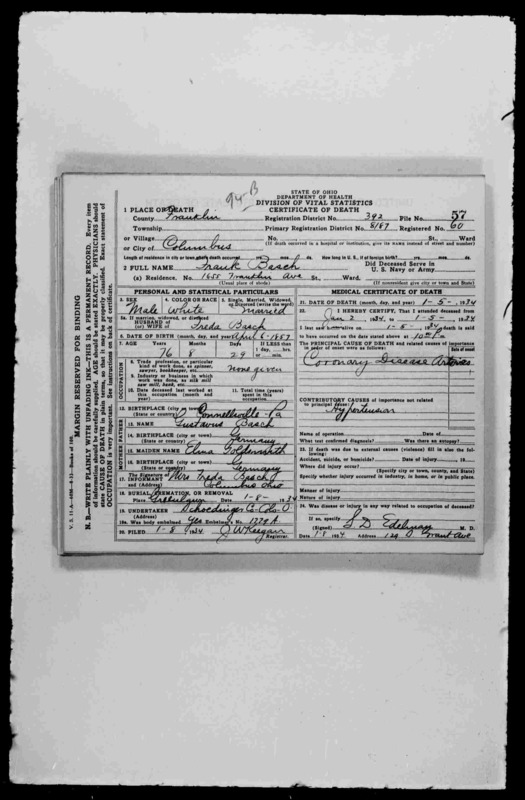 Hinda Basch, death certificate, Ohio Deaths, 1908-1953,” database with images, FamilySearch (https://familysearch.org/ark:/61903/3:1:33S7-9PKP-W466?cc=1307272&wc=MD9X-TP8%3A287599501%2C294550101 : 21 May 2014), 1944 > 36501-39300 > image 1707 of 3268. As seen in my last post about the Basch family, the children of Lena Goldsmith Basch suffered two losses in 1915. Their brother Jacob died on April 5, 1915, and Ella’s husband Isidor Shatz died seven months later. But not all the events of the 1910s were sad ones. On February 5, 1917, Lena and Gustavus Basch’s oldest granddaughter, Frank’s daughter Rae, married Sidney Katz in Columbus. She was twenty years old, and he was 28. Rae’s younger brother Lewis served in World War I. He enlisted on October 18, 1918, when he was just eighteen. He was discharged two months later after the war ended.9 In 1920 he was back in Columbus, living with his parents Frank and Fred and his sisters and attending Ohio State University. According to the 1920 census, no one in the household was employed. Thus, as of 1920, the surviving five children of Lena Goldsmith and Gustavus Basch were all living in Columbus, Ohio. 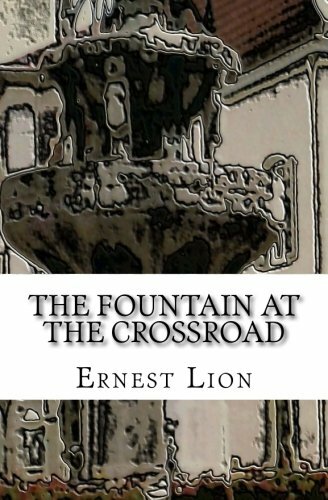 The 1920s brought another marriage and more children to the extended family. On March 9, 1925, Frank and Freda (Rosenthal) Basch’s youngest child Ruth married Sigmund S. Front in Columbus. As for the other Basch siblings, the 1920s were relatively quiet. Joel Basch and his family continued to live in Columbus. In 1926, Joel purchased for investment a building in Columbus, perhaps with his inheritance from his brother Jacob.22 In 1930, Joel was still in the tobacco business and living with his wife Jeanette and sons Sidney and Gustavus in Columbus. Sidney was working as a clerk in a finance company and Gustavus as a salesman in a furniture store. 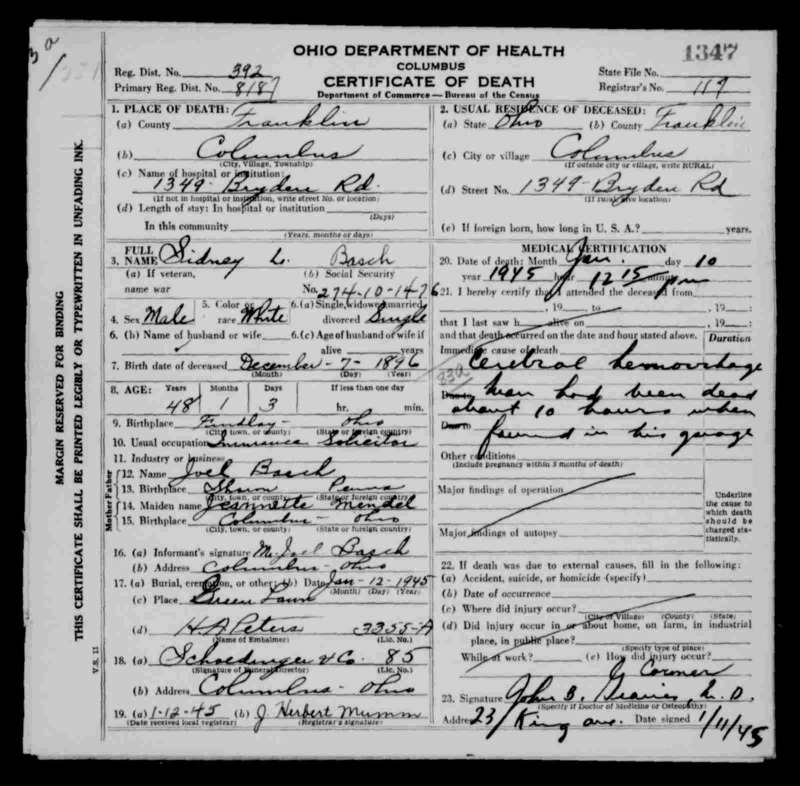 “Ohio Deaths, 1908-1953,” database with images, FamilySearch (https://familysearch.org/ark:/61903/3:1:S3HT-D4LQ-GG4?cc=1307272&wc=MD96-DN5%3A287601401%2C287598802 : 21 May 2014), 1930 > 00001-02900 > image 2674 of 3183. There were now four remaining siblings left in the Basch family: Frank, Hinda, Joel, and Joseph, all living in Columbus, Ohio. By 1940, there would only be three left. By 1910, Lena Goldsmith and her husband Gustavus had passed away, but they were survived by their six children and by nine grandchildren—Frank’s four children, Joel’s three children, and Joseph’s two children. All their children and grandchildren were living in Columbus, Ohio, except for their daughter Ella, who was living with her husband Isidor Shatz in Findlay, Ohio. Two members of the family died in 1915. First, Jacob Basch died at age 56 from a cerebral hemorrhage on April 5, 1915. He had been suffering from chronic nephritis and myocarditis. His brother Joel was the informant on the death certificate. Ohio, County Death Records, 1840-2001,” database with images, FamilySearch (https://familysearch.org/ark:/61903/3:1:S3HT-62VC-K3N?cc=2128172&wc=7DZ2-PQ7%3A1296032501%2C1296751602 : 2 October 2014), Franklin > Death certificates, 1915, no 1-1803 > image 995 of 1856; county courthouses, Ohio. Jacob had never married and had no descendants, but he left a very long and very detailed will, and it is clear from reading it just how close-knit these siblings were. Jacob provided for all five of his siblings and named all three of his brothers to be the executors of his will. It is obvious that he gave a lot of thought to how he wanted his assets divided. ITEM I. I direct that all my just debts and funeral expenses be paid out of my estate as soon as practicable after the time of my decease. ITEM II. I give and bequeath to the National Jewish Hospital for Consumptives in Denver, Colorado, the sum of one thousand dollars ($1000.00). ITEM III. I give and bequeath to the United Jewish Charities of Columbus, Ohio, the sum of five hundred dollars ($500.00). ITEM IV. I give and bequeath to my brother Joseph Basch, in trust, the sum of five thousand dollars (5000.00) upon the following trust and purpose, to-wit: to construct and erect, at a cost not to exceed the sum of five thousand dollars ($5000.00) an income producing structure upon the plot of ground described and delineated as lot seventy-six (76), Sullivan’s Addition to the city of Columbus, Ohio, being the piece of ground hereinafter devised to my brother Joseph Basch for and during his natural life, and upon his death, to his children, share and share alike absolutely and in fee simple. I direct that the trust fund provided for in this Item of my will be raised by the sale of such amount of my said securities as shall be necessary. In the event that said structure shall not cost the sum of five thousand dollars ($5000.00), the balance of said trust found shall be distributed among my brothers and sisters, share and share alike. ITEM V. I give and bequeath to my brother Frank Basch an equal one-fifth (1/5) part of my personal property remaining after the payment of my just debts and funeral expenses and the legacies mentioned in Items II and III of this my last will and testament and the setting aside of the trust fund provided for in Item IV of this my last will and testament. ITEM VI. I give and bequeath to my brother Joel Basch an equal one-fifth (1/5) part of my personal property remaining after the payment of my just debts and funeral expenses and the legacies mentioned in Items II and III of this my last will and testament and the setting aside of the trust fund provided for in Item IV of this my last will and testament. ITEM VII. I give and bequeath to my brother Joseph Basch an equal one-fifth (1/5) part of my personal property remaining after the payment of my just debts and funeral expenses and the legacies mentioned in Items II and III of this my last will and testament and the setting aside of the trust fund provided for in Item IV of this my last will and testament. ITEM VIII. I give and bequeath to my brother Joseph Basch in trust the remaining two-fifths (2/5) part of my personal property remaining after the payment of my just debts and funeral expenses and the legacies mentioned in Items II and III of this my last will and testament and the setting aside of the trust fund provided for in Item IV of this my last will and testament, to be held and used by him during the lives of my sisters Hinda Basch and Ella Schatz and during the life of the survivor of them, upon the following trust, to-wit: To invest and re-invest the proceeds of said personal property in United States, state or municipal bonds or in first mortgages upon improved city real estate, and to pay each of my said sisters Hinda Basch and Ella Schatz during their lives an equal one-half (1/2) of the net income of said investments, and after the death of one of my sisters to pay all the income of said investments to the survivor of them. After the death of my said sisters Hinda Basch and Ella Schatz and the survivor of them, I give and bequeath said principal sum herein provided to Joseph Basch in trust of my said sisters, to my brothers Frank Basch, Joel Basch and Joseph Basch, share and share alike. 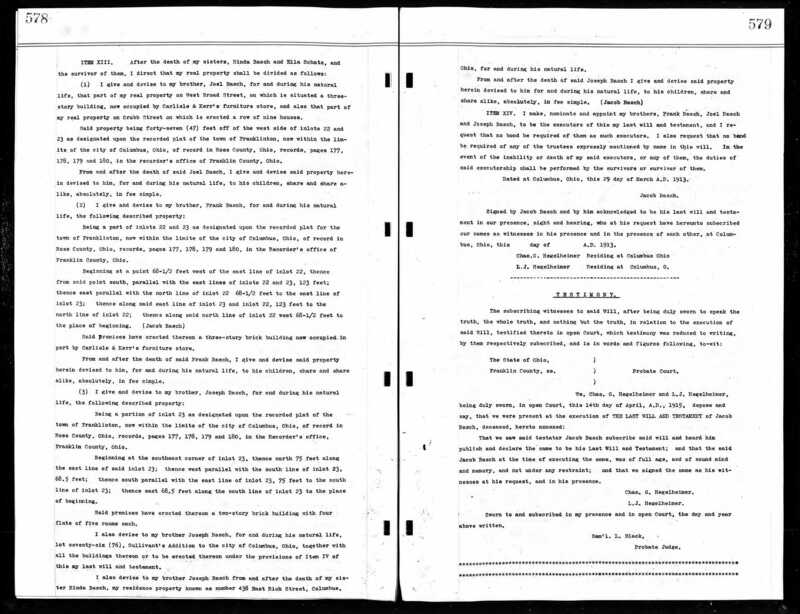 In the event of the death of either or any of my said brothers before the death of the survivor of my said sisters Hinda Basch and Ella Schatz, then the share of said principal which would have been received by said deceased brother, if living, shall be distributed among his children, then living, share and share alike. ITEM IX. In the division of my personal property bequeathed in Items V, VI, VII and VIII of this my last will and testament, I direct that the then value of my personal property be first ascertained and that a sufficient amount in cash to pay the legacy bequeathed to my brother Joseph Basch in trust for my sisters Hinda Basch and Ella Schatz and the survivor of them, be raised by the sale of such amount of my securities as shall be necessary. 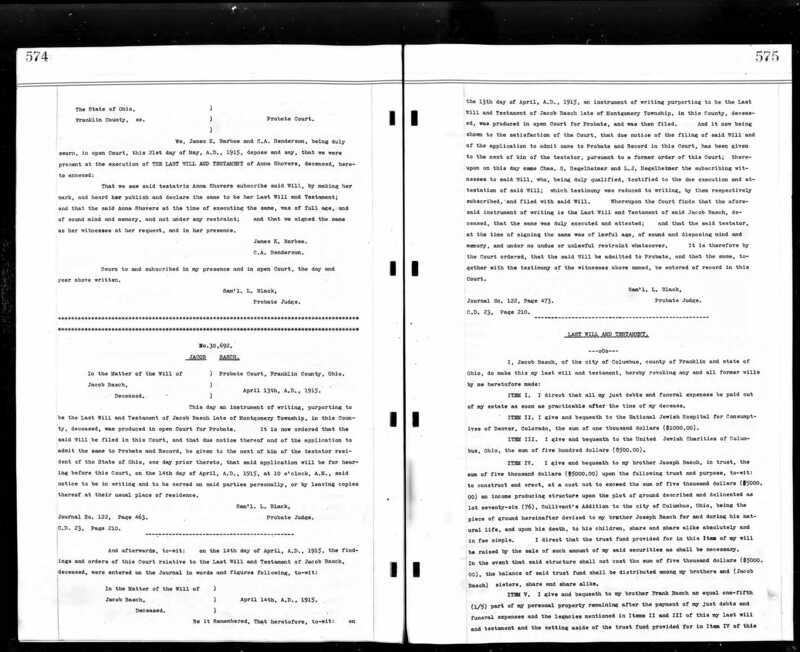 I further direct that my said legatees Frank Basch Joel Basch and Joseph Basch may retain by way of investment any securities belonging to my estate at the time of my death, dividing said securities amongst themselves in such manner as to carry out the provisions of Items V, VI, and VII of this my last will and testament. In the event that my said legatees Frank Basch, Joel Basch and Joseph Basch can not agree as to the manner of division of such securities, then I direct that my executors shall sell all of said securities and apportion the proceeds in the manner directed in Items V, VI, and VII of this my last will and testament. In the event of the death of my said trustee, Joseph Basch, I then appoint my brothers Frank Basch and Joel Basch and the survivor of them to act as such trustees and trustee, with full power to carry out the provisions of said trust. I further direct that said trustees and trustee shall be bound by the limitations imposed upon my said trustee, Joseph Basch, as to the manner of investing said trust fund. It is also my will that all future trustees who may be appointed to carry out the provisions of the within trust be likewise bound by said limitation as to the manner of investing said trust fund. ITEM X. I give and devise to my sister Hinda Basch for and during her natural life my residence property known as 438 East Rich Street, Columbus, Ohio. From and after the death of said Hinda Basch I give and devise said property herein devised to her for and during her natural life to my brother Joseph Basch for and during his natural life. From and after the death of my said brother Joseph Basch, I give and devise said property herein devised to him for his natural life to his children, share and share alike absolutely, in fee simple. I give and bequeath to my sister Hinda Basch absolutely all furniture, books, pictures and household effects which at the time of my decease shall be in, about or belonging to my aforesaid residence. ITEM XI. I give and bequeath to my sister Hinda Basch an annuity of twelve hundred dollars ($1200.00) per year, for and during her natural life, payable on the first day of each and every month, and the payment of the same is hereby made a charge upon the realty hereinafter devised to my sister Ella Schatz, for and during her natural life. It is my will and I direct that said annuity of twelve hundred dollars ($1200.00) per year shall be a first and best lien on said real estate hereinafter devised to my said sister, Ella Schatz, for and during her natural life, and in the event said premises shall be destroyed by fire or rendered unfit for habitation so that the income derived from said real estate shall not be sufficient to pay said annuity, then in that event said annuity shall be paid out of the fund or funds realized from the fire insurance on said real estate. It being my will that in any and all events my said sister, Hinda Basch, shall receive an annuity of twelve hundred dollars ($1200.00) per year payable out of the real estate, either income or principal, hereinafter devised to my said sister, Ella Schatz, for and during her natural life. In the event of the death of my said sister, Hinda Basch, before the death of my said sister, Ella Schatz, it is my will and I so direct, that my said sister Ella Schatz shall enjoy all of the net income of my said real estate hereinafter devised to her for and during her natural life. ITEM XII. I give and bequeath to my sister Ella Schatz, for and during her natural life, subject to the annuity hereinbefore bequeathed to my sister Hinda Basch, all my real property, except my residence property hereinbefore devised to my sister, Hinda Basch. My said devisee Ella Schatz shall keep the buildings upon said real estate in good repair and insured against loss by fire, and shall pay for such repairs, premiums of insurance, taxes and charges of every kind which may be lawfully claimed against said real estate. In case of loss by fire or other damage to such buildings and houses, I direct that my said devisee, Ella Schatz, shall rebuild and repair such property and pay for such rebuilding and repairing from the funds received for insurance. In the event of the death of my said sister, Ella Schatz, before the death of my sister Hinda Basch, then in that event I give, devise and bequeath all of said real estate herein devised to my sister Ella Schatz, for and during her natural life, to my sister Hinda Basch, for and during her natural life. ITEM XIV. I make, nominate and appoint my brothers, Frank Basch, Joel Basch and Joseph Basch, to be the executors of this my last will and testament, and I request that no bond be required of them as such executors. I also request that no bond be required of any of the trustees expressly mentioned in this will. In the event of the inability of death of my said executors, or any of them, the duties of said executorship shall be performed by the survivors or survivor of them. Jacob was apparently quite a well-to-do man, having not only what appears to be a fair amount invested in securities but also substantial real estate holdings. He also had a very sophisticated and specific plan for how he wanted his assets distributed. He appears to have had a slight bias in favor of his youngest sibling Joseph—giving him a special bequest of $5000 to build an income-producing building in addition to the bequest of his one fifth of the residual estate and naming him as the trustee of the trusts for his sisters Hinda and Ella and as their successor in interest after both had died. But overall he provided in his will for all five of his siblings and for his nieces and nephews. Just seven months after Jacob’s death, his sister Ella lost her husband Isidor Shatz. Isidor was 67 and died on November 18, 1915 from paralytic ileus (an intestinal obstruction) and the suppression of urine followed by uremia. Joseph Basch was the informant on his death certificate. And although Isidor and Ella had been living outside of Columbus for all their married years, Isidor was, like Jacob and his parents, buried at Green Lawn Cemetery in Columbus. 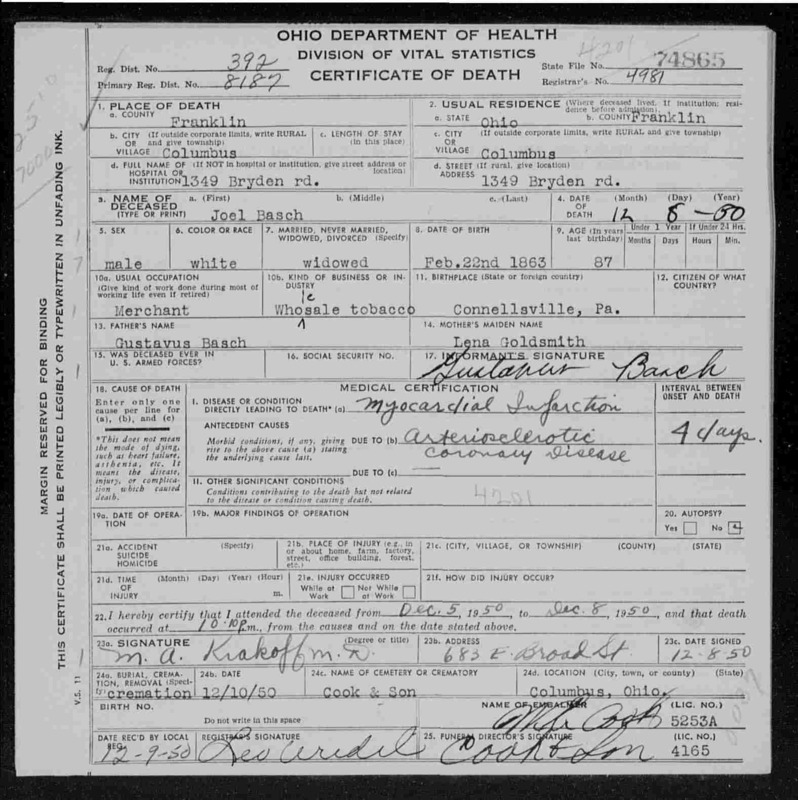 “Ohio Deaths, 1908-1953,” database with images, FamilySearch (https://familysearch.org/ark:/61903/3:1:33SQ-GPFX-SYCQ?cc=1307272&wc=MD9F-XTL%3A287601901%2C294657901 : 21 May 2014), 1915 > 57771-60750 > image 2547 of 3300. Ella then returned to Columbus and was living with her sister Hinda at 438 East Rich Street, the long-time family residence that Jacob had bequeathed to Hinda. From there Ella was also in a better position to maintain the real estate that Jacob had left to her. As of 1900, Lena Goldsmith Basch was living with her husband Gustavus and two of her adult children, Jacob and Hinda, in Columbus, Ohio. Two of her other children—Frank and Joseph—were also still living in Columbus with their families. And the final two of her six children—Joel and Ella—were living with their families in Findlay, Ohio. Gustavus and Lena had five grandchildren in 1900—Frank’s three children and Joel’s two sons. A year and a half later on January 24, 1903, the family suffered a tragic loss when four-year-old Robert Basch, the son of Joel and Jeanette Basch, died.2 According to the February 5, 1903 issue of the local Findlay newspaper, The Weekly Jeffersonian (p.7), little Robert died from Bright’s disease or what we would now call nephritis—kidney disease. Both Gustavus and Robert were buried at Green Lawn Cemetery in Columbus. And who was Elene Rosalie named for? Sadly, her grandmother Lena Goldsmith Basch died just two weeks before Elene and Gustavus were born, and Elene must have been named for Lena. Lena was 80 years old and died from cerebral sclerosis from which she’d been suffering for five years, according to her death certificate. She was also buried at Green Lawn Cemetery in Columbus. 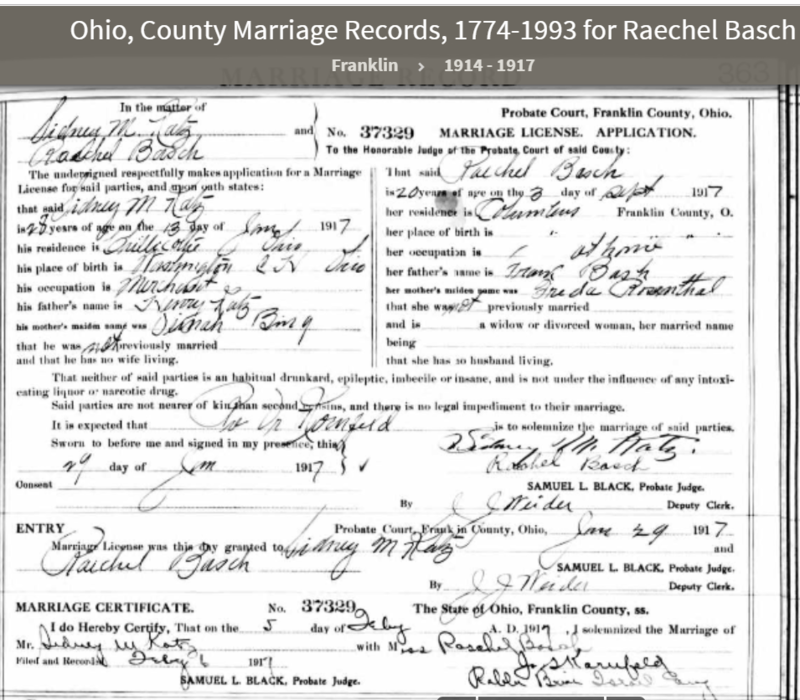 Ohio, County Death Records, 1840-2001,” database with images, FamilySearch (https://familysearch.org/ark:/61903/1:1:F6VT-TY1 : 10 March 2018), Lena Basch, 26 Mar 1906; citing Death, Columbus, Franklin, Ohio, United States, source ID 1906 v 2 fn 176, County courthouses, Ohio; FHL microfilm 2,032,443. Lena and Gustavus were survived by all six of their children and their grandchildren. 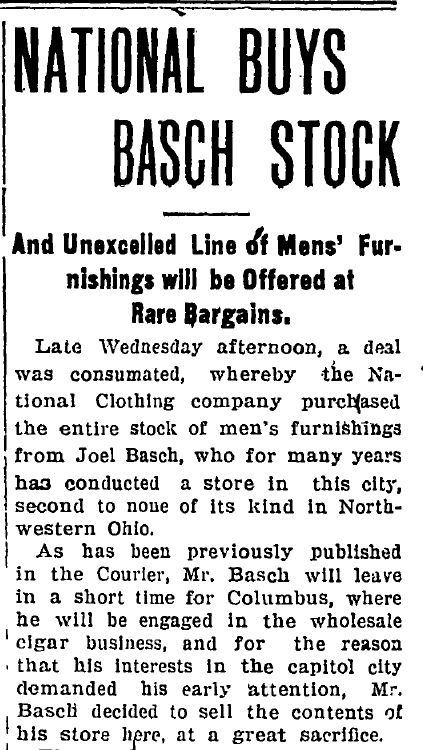 Not long after his mother’s death in March, 1906, Joel moved back to Columbus. He sold his business in Findlay “at a great sacrifice” in order to return to Columbus, as reported in the Findlay Courier-Union on April 13, 1906 (p. 8); his father-in-law Levy Mendel had died just a month before Lena—on February 10, 1906,8 and apparently with the demise of both his mother and his father-in-law, he was needed back in Columbus to help run Levy Mendel & Company. In fact, on the 1910 census, Frank reported that he had not worked for the entire year. Was he ill? Or had he just retired? He was only 53 years old in 1910. But since he lived another 24 years and listed that he was retired in 1920, I am inclined to think that Frank had just taken an early retirement. His four children were still quite young in 1910—ranging from five to fourteen years old. How fortunate he was to be able to retire and spend more time with them. I was very fortunate to find an oral history interview that was done by the Columbus Jewish Historical Society with Alan Weiler, grandson of Joseph Basch, on April 8, 2008. There are other interesting parts of this interview that I may refer to in later posts, but for now, I just wanted to quote this small portion that sheds light on the business in which Joseph, Joel, and their parents Gustavus and Lena had been involved and gives a snapshot of Joseph Basch himself. 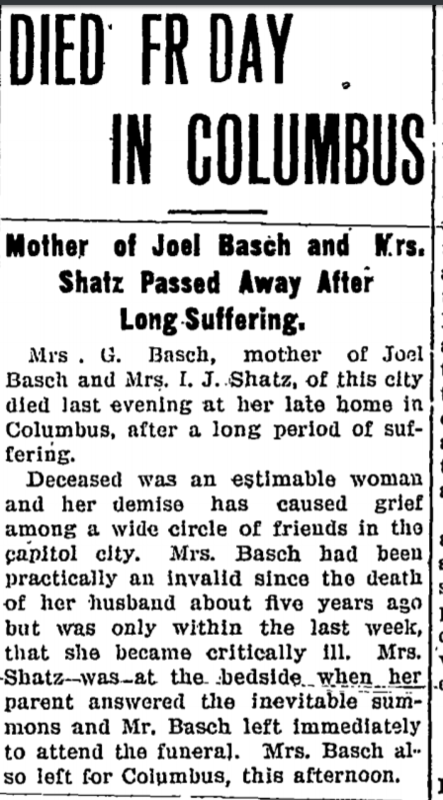 Finally, the remaining sibling, Ella Basch Shatz, was living in 1910 with her husband Isadore in Findlay, Ohio, where Isadore was a clothing merchant.15 With Joel’s return to Columbus in 1906, five of the six Basch siblings were now living in the same community. Only Ella was living outside of Columbus; she and her husband Isadore Shatz were still in Findlay even after her brother Joel and his family left that city.I wonder what it was like for Ella being the only family member not living in Columbus. And I wonder whether she spent time visiting her siblings and nieces and nephews who were living about ninety miles away. She would, however, be moving back to Columbus in the next decade. Gustavus and Lena Goldsmith Basch 1890-1900: Who Was Louis Basch? In 1890, Lena Goldsmith Basch and her husband Gustavus Basch and four of their six children were living in Columbus, Ohio, where she and Gustavus were involved in a cigar business called Levy Mendel & Company. Their son Joseph was also working there in 1890. Their older sons Frank and Jacob were in the junk business together, doing business as Basch Brothers. Daughter Hinda was also living with her parents and brothers at 407 East Rich in Columbus. Two of Gustavus and Lena’s children had left Columbus by 1890. Their younger daughter Ella had married Isadore Shatz in 1888 and moved to Cincinnati. 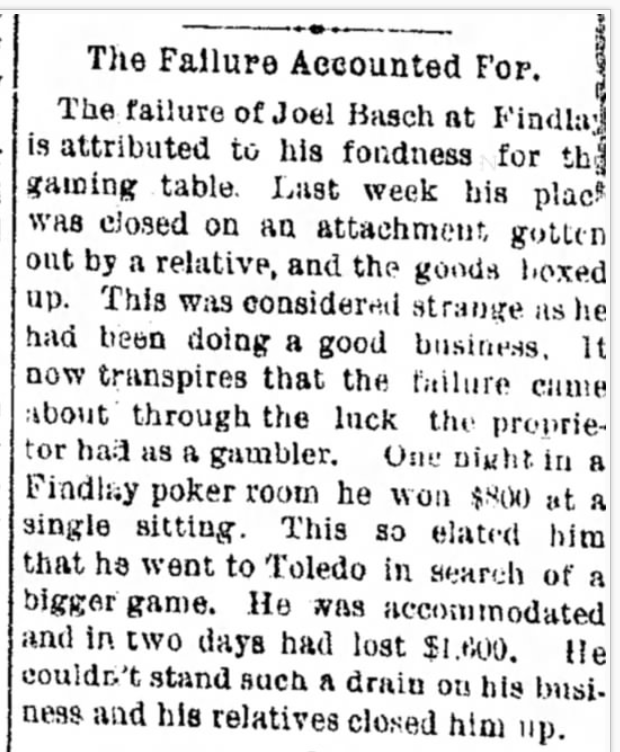 Their third oldest son Joel was living first in Lima, Ohio, and then in Findlay, Ohio, but in 1890, his business in Findlay had failed after he had incurred some substantial gambling debts. 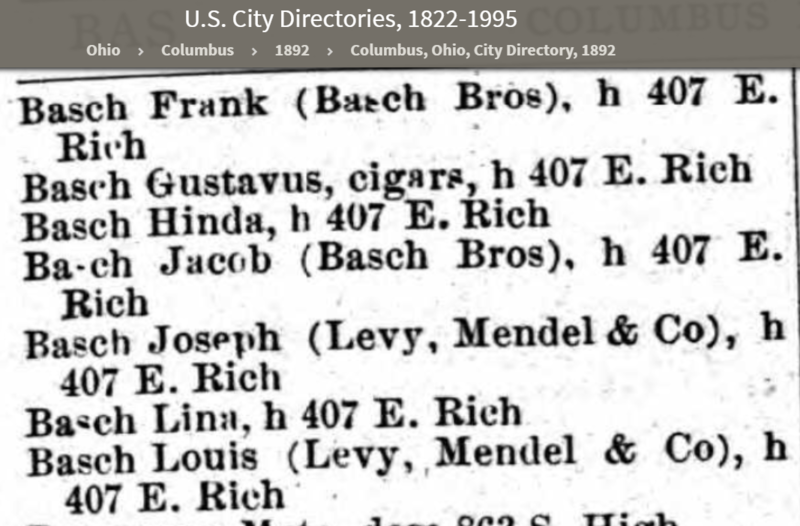 Look at that last entry for Basch—Louis Basch, living at the same address—407 E. Rich—as the other family members and working for Levy Mendel & Co. Louis Basch also appears in the 1893 Columbus directory.2 Who was he? My search for a Louis Basch led me nowhere. There were a few men named Louis Basch, but they were all born much too late to be this Louis Basch or were living too far away. So then who was Louis Basch? There was never a Louis Basch living in the same household as Gustavus and Lena on any census record. I did notice that Lena was not listed in most of the directories for the later 1890s, but Louis Basch was. Had she taken on the pseudonym of Louis Basch? 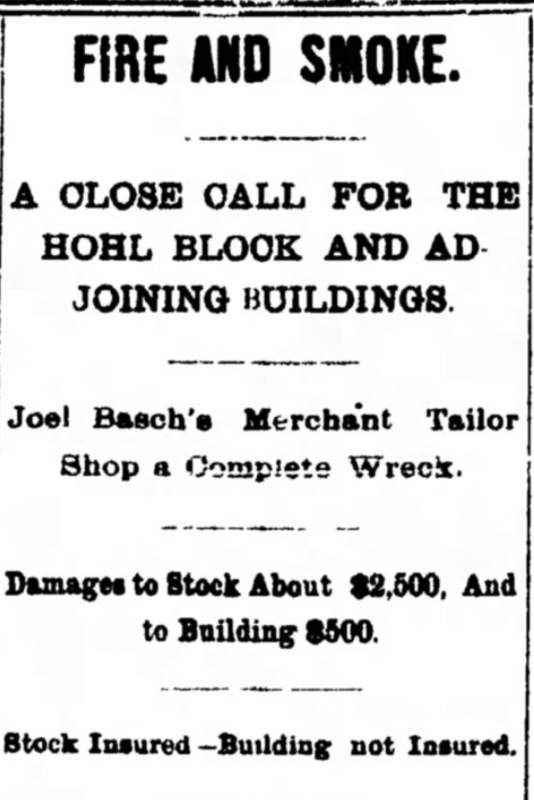 After all, as reported in the prior post, the family’s junk business had once been known as L. Basch & Sons, where the L was apparently for Lena. Perhaps to disguise the fact that the business was run by a woman the family had created a male pseudonym? What do you think? On January 25, 1893, Joel became the second of Gustavus and Lena’s children to marry. He married Jeanette Mendel, and guess whose daughter she was? Yes, Levy Mendel, the owner of the cigar company where Joel’s parents Gustavus and Lena and his brother Joseph and the mysterious “Louis” were then associated. 3 I would think that Levy Mendel must have been familiar with Joel’s past gambling issues and would not have permitted his daughter to marry Joel if he believed those problems persisted. So perhaps Joel had cleaned up his act and had been working for his future father-in-law’s business in the years before his wedding to Jeanette. As far as I can tell, Joel had no further gambling issues in his life. Lima (OH) News, January 10, 1893, p. 8. By 1894 Joel was was living with his wife and family in Findlay, Ohio, ninety miles away from Columbus. He and Jeanette had two sons born in the 1890s, Sidney Louis Basch on December 7, 1894,4 and Robert Basch on June 26, 1898.5 Both boys were born in Findlay, Ohio. 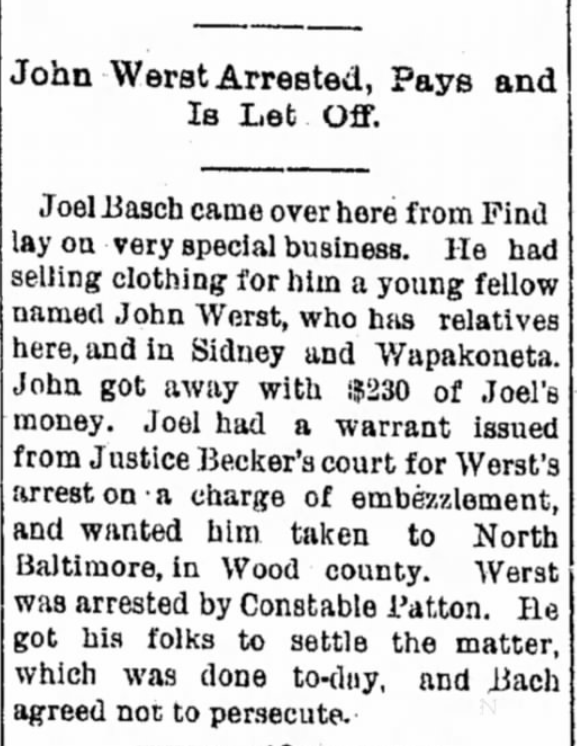 In 1900, he and Jeanette and their two young sons were living in Findlay, and Joel listed his occupation as a merchant. 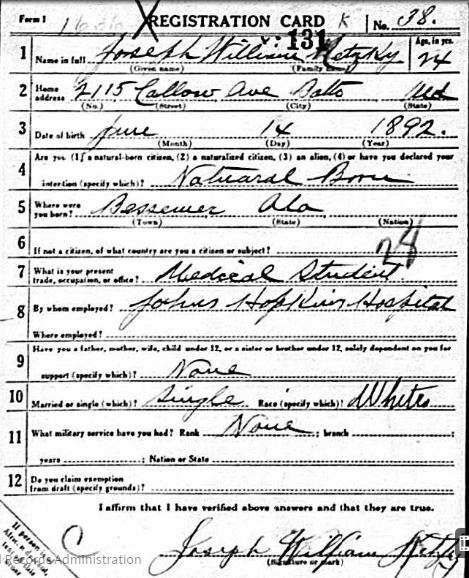 In 1900, Gustavus and Lena were living with Jacob and Hinda and a servant; Gustavus reported that he was a landlord on the 1900 census, and Jacob was an iron merchant.13 Gustavus and Lena had five grandchildren by 1900—Frank’s three children and Joel’s two sons. More would arrive in the next decade. But that first decade of the 20th century would also bring some painful losses. With my last Goldsmith post, I finished the saga of Jacob Goldsmith and his fourteen children. Now I will turn to Jacob’s sister, Lena Goldschmidt Basch and her story. 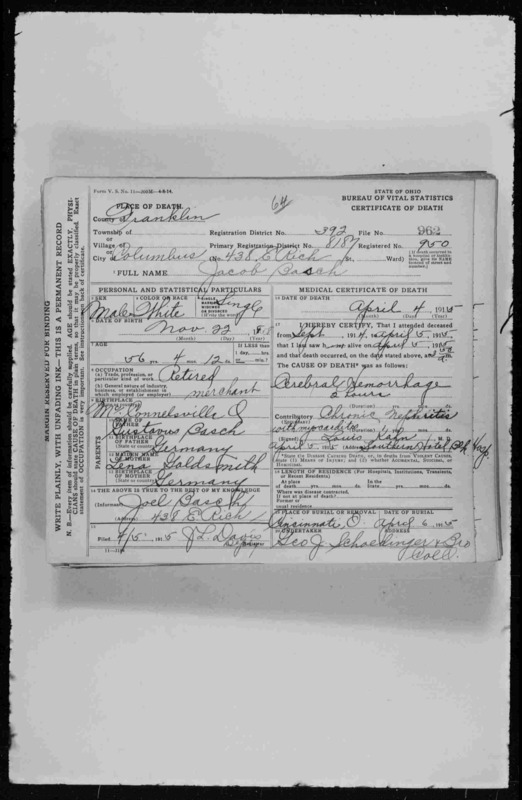 We’ve already seen that Lena, who was born to my 4-times great-uncle Simon Goldschmidt and his first wife Eveline Katzenstein in Oberlistingen on April 17, 1828, immigrated to the US in the 1850s and married Gustavus Basch in 1856. They first lived in Connellsville, Pennsylvania, then in Pittsburgh, and finally by 1878 had relocated to Columbus, Ohio, where they remained for the rest of their lives. So who was L.Basch? At first I thought it might be Gustavus’ father, whose name was Louis. But there is no listing in the 1880 census or any other census for an L. Basch who could have been Gustavus’ father. I don’t think he ever left Germany. Had Gustavus named the business in honor or memory of his father? Or could the L stand for Lena? That certainly would have been unusual—to have a business named for a mother and her sons, especially since Gustavus was still alive and well. So “L. Basch” was Lena! How interesting that she was the one for whom this business was named, not her husband. In fact, in 1884, Gustavus isn’t even listed with the L. Basch & Sons business; Lena must have been the one in charge. 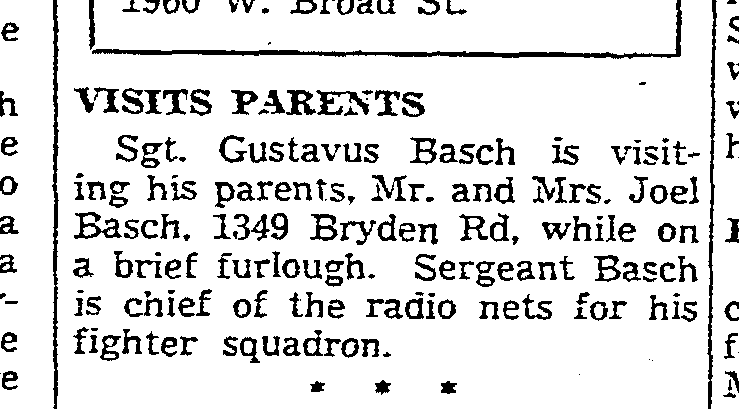 In 1886, Gustavus is back in the listings as G. Basch, junk dealer, and now the family is residing at 335 E. Rich. Frank and Jacob were now working at L. Basch & Sons; Joel was working as a cutter, and Joseph was a salesman. 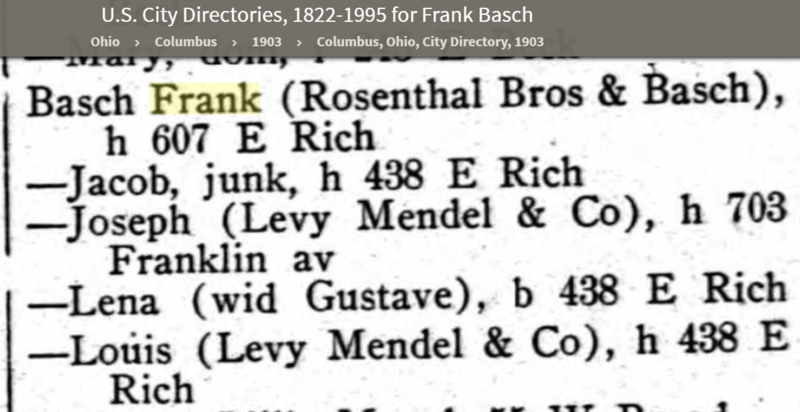 Now Gustavus was associated with Levy Mendel & Co, as was “L[ena] Basch;” Frank and Jacob were still in the L.Basch & Sons junk business, and Joseph continued to work as a salesman. They all, as well as Hinda, were living at 407 E. Rich. Only Joel and Ella were not listed. Where were they? As for Joel, I could not find him in the Columbus directories after 1886, so I turned to the newspaper databases to see if I could locate him. 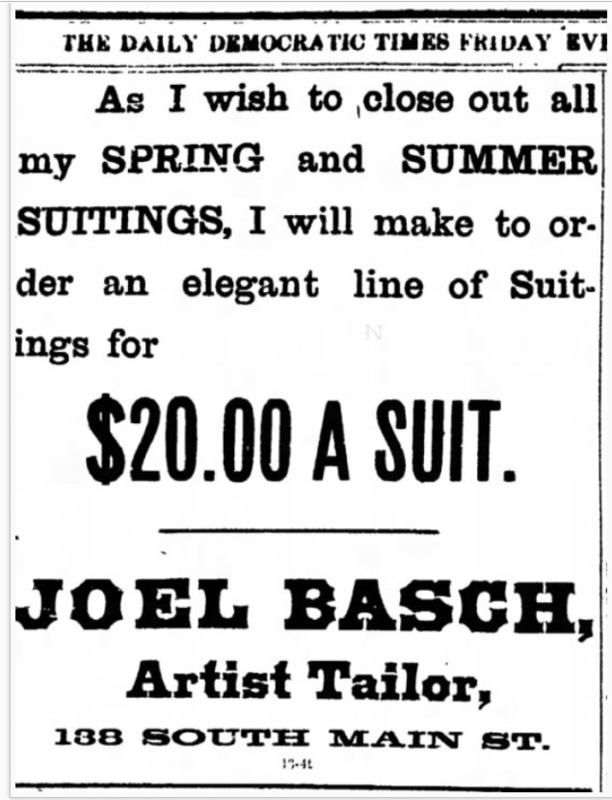 From this ad in The Lima News of June 29, 1888 (p.4), I knew that Joel had moved to Lima, Ohio, where he was an “artist tailor” making men’s suits for $20. Twenty dollars—imagine that! Lima is approximately 90 miles from Columbus. By 1889 Joel had apparently left Lima and was working in Findlay, Ohio, which is 34 miles from Lima and 92 miles from his family in Columbus. This article reports that one of Joel’s employees had embezzled $230 from Joel. Given that ending to his Findlay business, I wondered whether the fire and reported embezzlement were also schemes engineered by Joel to cover gambling debts. Looking at Gustavus’ work record beginning in 1860 raises some questions about his business acumen as well. 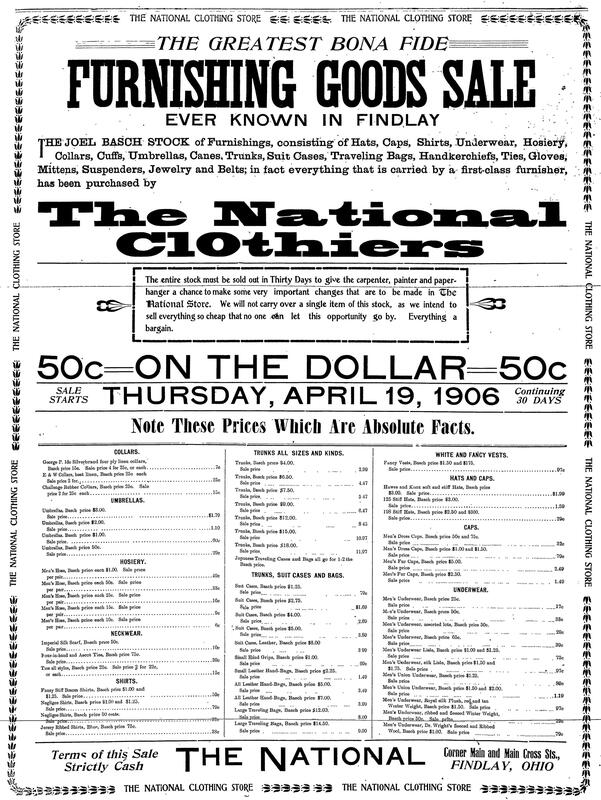 In 1860, he was a clothing merchant in Connellsville. In 1870, he was working for H. Bier & Company, a brass foundry in Pittsburgh. In 1880, he was in Columbus working for a vinegar company. In the 1880s he worked for some of the time in L. Basch & Sons, a junk dealership run by his wife Lena, and then for Levy Mendel & Company, a cigar company. There are some directories where he had no occupation listed. That is quite a list of businesses over a thirty year period with no real consistency in the industries in which he worked—clothing to brass to vinegar to junk to cigars. The fact that he also moved with his family several times also creates a sense of instability. But once the family settled in Columbus in the 1880s, for the most part they stayed put. Maybe Gustavus was a renaissance business man, using his skills in numerous varied enterprises, and not a flighty man who couldn’t find his niche. It’s hard to know. UPDATE on Rebecca Goldsmith Levy: I was able to obtain a copy of her death certificate from Colorado. Please see this post for more information. In the last post we saw how a number of Jacob Goldsmith’s children left Pennsylvania when they reached adulthood. But Jacob Goldsmith’s children weren’t the only descendants of Simon Goldsmith who moved from Pennsylvania in the 1870s. As for Simon’s two youngest children, my double cousins Henry and Hannah, they were busy having children during the 1870s and 1880s. Henry and his wife Sarah Jaffa continued to live in Connellsville, Pennsylvania, where Henry was a clothing merchant. In addition to their first child, Jacob W. Goldsmith, who was born in 1871, Sarah gave birth to four more children between 1873 and 1880: Benjamin (1873),3 Milton (1877),4 Samuel (1879),5 Edison (1880).6 Five more would come between 1881 and 1889: Walter (1881),7 Florence (1883),8 Albert (1884),9 Oliver (1887),10 and Helen (1889).11 In total, Henry and Sarah had ten children. All were born in Connellsville. 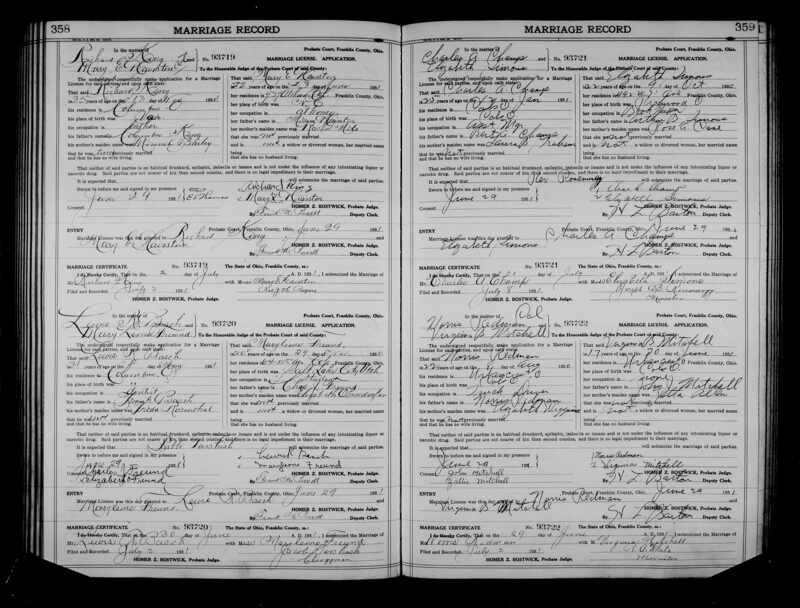 Hannah and her husband Joseph Benedict stayed in Pittsburgh where Joseph is listed on the 1880 census as a rag dealer. 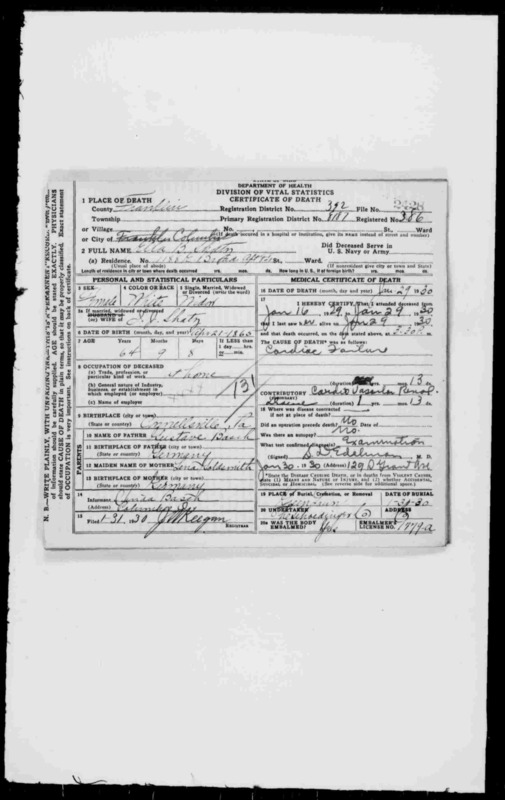 Hannah gave birth to her third son, Centennial Harry Benedict, on September 24, 1876, in Pittsburgh.12 In most records he is referred to as either C. Harry or Harry; I assume the Centennial was in honor of the centennial of the Declaration of Independence in the year he was born. 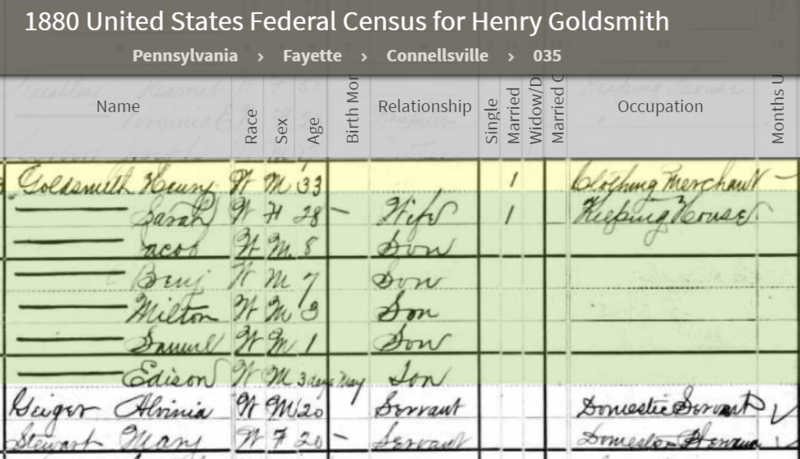 The 1880 census lists not only Hannah and Joseph and their three sons in the household, but also Hannah’s father Simon, and three of Hannah’s nephews: Lena’s son Jacob Basch and Henry’s sons Jacob and Benjamin Goldsmith. 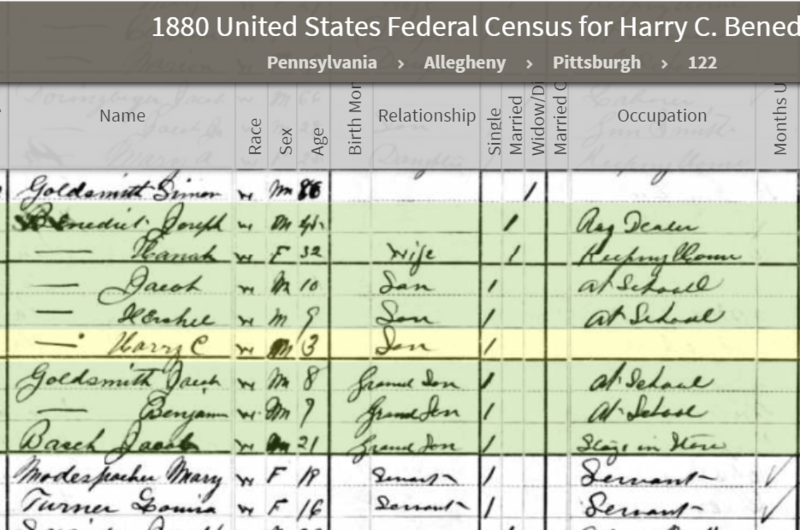 Since all three are also listed elsewhere on the 1880 census, I wonder whether these three were just visiting their relatives in Pittsburgh when the census was taken. On March 17, 1883, at the age of 88 or so, Simon Goldsmith died in Pittsburgh; his death record states that he died of old age. Pennsylvania, Pittsburgh City Deaths, 1870-1905,” database with images, FamilySearch (https://familysearch.org/ark:/61903/1:1:XZ7D-M2S : 11 March 2018), Simon Goldsmith, 17 Mar 1883; citing v 33 p 550, Allegheny County Courthouse, Pittsburgh; FHL microfilm 505,832. What an interesting, challenging, and rich life Simon had. He was born Simon Goldschmidt, the youngest child of Jacob Falcke Goldschmidt and Eva Seligmann in Oberlistingen. He had five children with his first wife Eveline Katzenstein, two of whom died as infants. He had spent time in prison for burglary, but his marriage and his family stayed together. After Eveline died in 1840, he had married a second time, his second wife being Fradchen Schoenthal. He and Fradchen immigrated to the US in 1845, a year after their marriage, and together they had two more children born in the US. Then Simon lost his second wife Fradchen in 1850. He also lost another child, his daughter Eva, sometime after 1862. But Simon soldiered on, living first with his son Jacob in Washington and later with his daughter Hannah in Pittsburgh. He saw twenty-eight grandchildren born before he died, and five more were born after he died. In addition, he lived to see the births of eight great-grandchildren, and many more were born after his death. When he died, his children and grandchildren were spread from Philadelphia to California, pursuing and living the American dream. He must have looked at his family with amazement—that this man who had gotten himself in trouble with the law back home in Germany had somehow been able to start over in the US and create a huge legacy for himself and his family. Despite his struggles and his losses, he must have been grateful for all that he did have. What would happen to Simon’s four surviving children and all those grandchildren and great-grandchildren? More in the posts to follow. We saw last time that as of 1915 when their father Gabriel Gump died, his four sons, Abraham, Louis, Harry, and Joseph, were all engaged in the family liquor business and that three of the four were living in Baltimore, where they’d been born and raised. 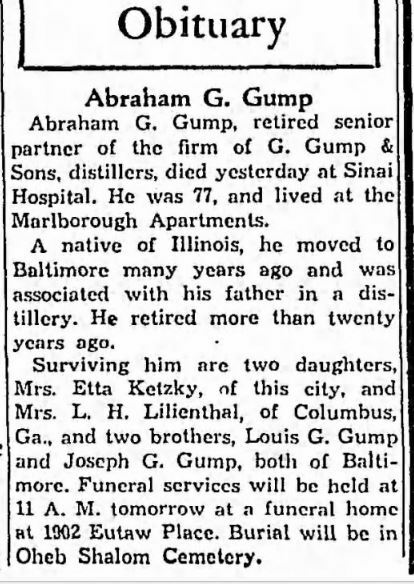 As of 1920, things had changed for Abraham Gump, the oldest son. He and his wife Jennie were living in Los Angeles, and Abraham listed no occupation on the 1920 census. Their two daughters had married. Etta, the older daughter, had married Joseph William Ketzky, who was a native of Alabama and a doctor. They would have two daughters. Ruth, Abraham’s younger daughter, had married Leslie Holzman Lilienthal, who was also a native of Alabama. In 1920, Ruth was living with Leslie in Selma, Alabama, with his parents, Henry and Annie Lilienthal. Henry was a dry goods merchant, and Leslie was working as a clothing salesman (perhaps in his father’s store). I wouldn’t have thought there was a Jewish community in Selma, Alabama, but as this photograph of Temple Mishkan Israel in that city suggests, there was quite a substantial one. According to this site, the synagogue was founded in 1870 and had about 80 members in the 1910s and 1920s. So how did two young women from Baltimore meet two men from Alabama? And how and why did their parents end up in Los Angeles? 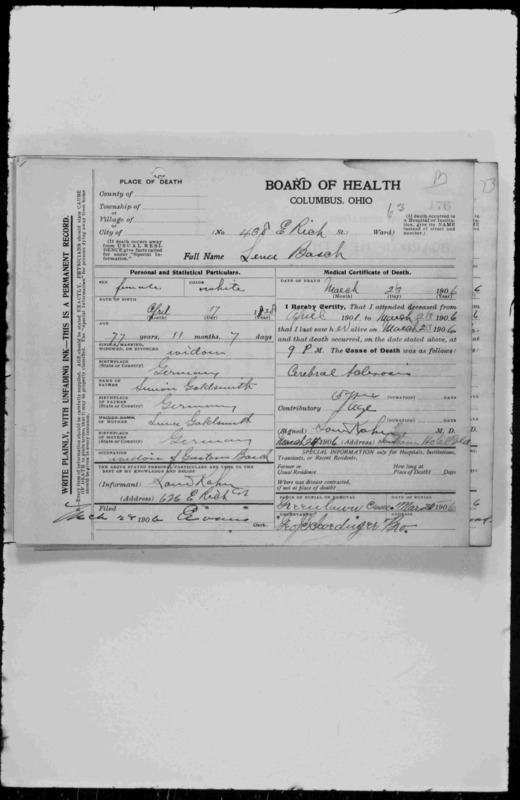 Well, according to his World War I draft registration, Joseph Ketzky had been a medical student at Johns Hopkins in Baltimore in 1917 and must have met Etta during that time. Presumably Etta and Joseph then set Etta’s sister Ruth up with Leslie Lilienthal. But I’ve no clue why Abraham and Jennie were living in California in 1920. Although I could not find him on the 1920 census, Louis Gump was still living in Baltimore according to several city directories from the early 1920s. In all three directories Louis listed his occupation as a salesman. Louis and Carrie’s daughter Rosalind and her family were also still in Baltimore; her husband Milton Wertheimer was a cigar manufacturer in 1920. So what had happened to the family liquor business? Prohibition. The Eighteenth Amendment had been ratified on January 29, 1919, banning the manufacture, transportation, and sale of alcohol. Although it did not take effect for another year, obviously the Gump brothers got out of the business before it was too late. By 1920, Abraham, Louis, Harry, and even Joseph were in or close to their fifties, and all but Joseph no longer were supporting children. It does not appear that they were too seriously affected by the loss of their business. After all, in 1925, Abraham and Jennie cruised to Cuba; they were back residing in Baltimore at that time. In 1929, they traveled to England. Louis and Carrie took a cruise to France in 1925. Harry and Mildred also cruised to France in 1925. Although they had to wait five additional years until 1930, even Joseph, Francella, and George got to take a trip to France that year. By 1930, circumstances had changed again. Abraham and Jennie were living in Atlantic City as of 1927, according to the city directory, but in 1930 they were again back in Baltimore, living with Etta and her two daughters. Although Etta still listed her marital status as married, by 1940 she reported that she was divorced. She was quite an accomplished golfer, apparently, as I found numerous articles recounting her participation in golf tournaments. Her younger sister Ruth had moved with her family to Columbus, Georgia, from Selma, Alabama, and her husband Leslie Lilienthal was a retail clothing merchant in Columbus. Louis Gump and his wife Carrie were still in Baltimore in 1930, and Louis was selling stocks and bonds. Their daughter Rosalind and her family were also still living in Baltimore where Milton was still a cigar manufacturer. Harry and Mildred were still in Wilkes-Barre in 1930; Harry was retired. And Joseph Gump and his wife and his son George were in Baltimore; Joseph was also retired. 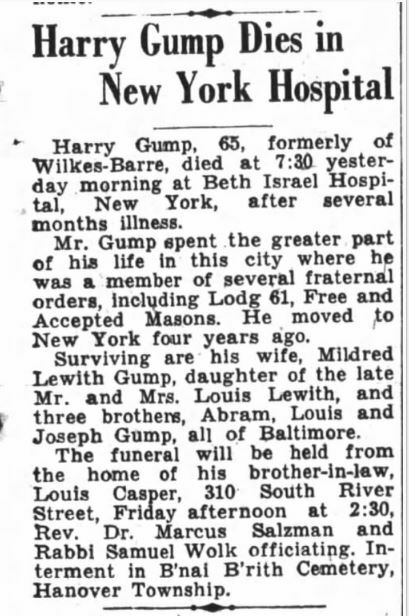 Louis Gump lived the longest; he died at age 87 on September 16, 1951. He had outlived his wife Carrie, who had died in 1940, and had been living with his daughter Rosalind and her family. As for the four Gump grandchildren, Rosalind lost her husband Milton in 1946; she lived until 1974 and died in Baltimore at age 86. Abraham’s daughter Etta Gump Ketsky died in 1953 at 57; she had never remarried. Her sister Ruth Gump Lilienthal died one month shy of her 100th birthday in 1999 in Columbus, Georgia. 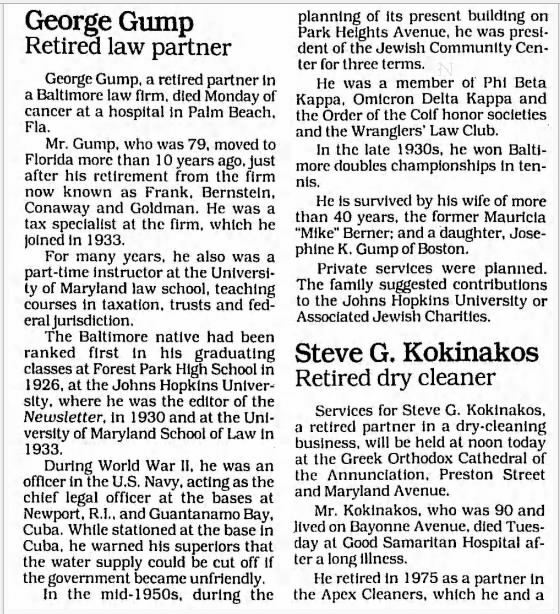 Joseph’s son George Gump served in the US Navy during World War II and became a tax lawyer; he died in 1988 when he was 79. This snapshot of the lives of the four sons of Gabriel Gump and Henrietta Mansbach and their children provided me with some insights into the effect that Prohibition had on some families in the US. Gabriel Gump had established a very successful wholesale liquor business in Baltimore, so successful that it was able to support all four of his sons and their families up until Prohibition. But that business was shut down by Prohibition. Even after Prohibition, however, the family lived quite comfortably. By 1933, when Prohibition was finally repealed by the 21st Amendment, the four Gump brothers were more or less retired and still apparently living well on whatever they’d earned from the business. They do not appear to have suffered from the destruction of their family business and lived relatively full and uneventful lives. That brings me to the end of my research about the three Mansbach cousins, the niece and nephews of my great-great-grandfather Gerson Katzenstein. Next, I will return to Gerson and his family.